Ok, you probably want more details. The main complaint I read about this polish is about the frosty finish. It is frosty/shimmery and I feel like that would be a lot more obvious if the polish was worn on its own. 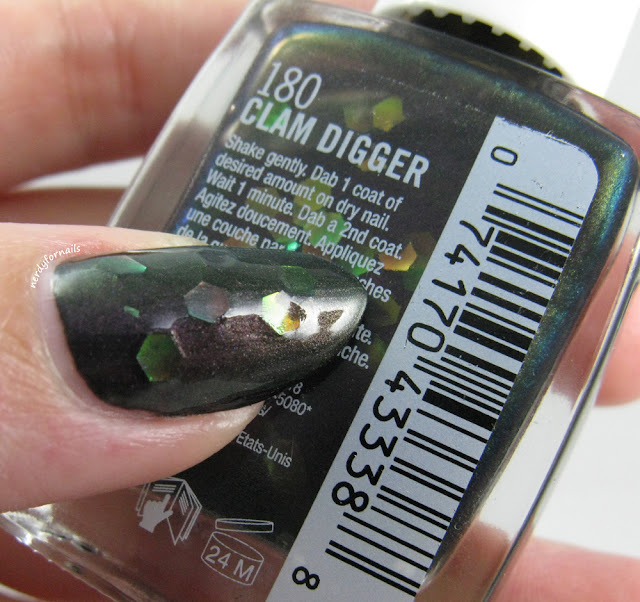 I thought Clam Digger needed a dark base color to show off its full potential so I have one coat of black polish on underneath. On top of that I have one coat of Clam Digger. The glitter payoff was good enough that I didn't feel it was necessary to do a second coat, but you would probably want to if you didn't use a base color. I did the dabbing method as suggested on the bottle to get the glitters into place, but I had no problem getting them out of the bottle. I didn't feel that the base was too thick or goopy in comparison to the glitter ratio either. 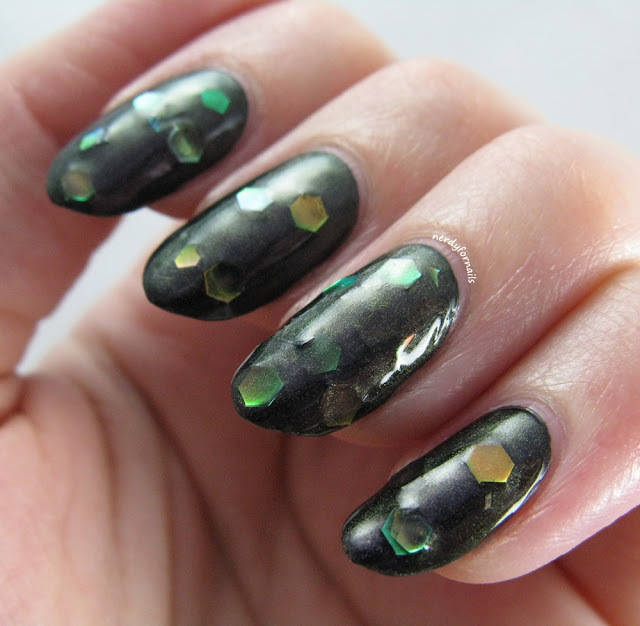 These large hexes are a very thin iridescent mylar material and they lay pretty flat on the nail. I added one layer of top coat and wasn't snagging on anything even though they look like they're coming off the nail. They're just that shiny. You can see just a hint of purple shimmer in my pictures, but it was much more noticeable in real life. 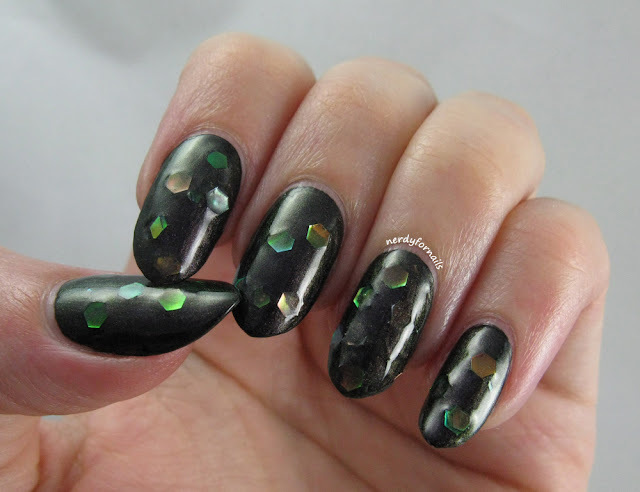 The base has a subtle shift from purple to a golden green shade that matches the hexes. I bet this polish would look lovely with a purple base to pick up more of those colors. Even though it's a bit frosty I didn't have any trouble with brush strokes as you can see. I got two colors to try so when I review the next one I'll use it without a base so you can get an idea of how these polishes behave on their own. What do you think about this one? Is it something you'd like to have in your own collection? There are 8 colors total and they retail at around $5.99. I've seen them at Target so far and they should also be available at other major drugstores.